The #ASPchat on Twitter occurs via @ASP_Chat on the third Thursday of each month from 7:00 PM to 8:00 PM EST. This forum is meant to stimulate conversation on all things related to antimicrobial stewardship. Absolutely everyone is invited to participate. There are no limitations and the more diverse the group, the better. We will be asking people in the fields relevant to the topic of that month to join in. Log onto Twitter on one of the scheduled dates. Follow the hashtag #ASPchat and follow @ASP_chat. From 7:00 to 8:00 PM EST on the dates below a tweet will be released every 10 minutes for the chat participants to comment on. Get involved by using #ASPchat in your tweets. Share your insights, opinions, helpful resources and stories. Retweet and like tweets during the conversation. You can also tag people in your tweets to draw attention to the #ASPchat twitter chat. You can share the graphic at the top of this page to help raise awareness as the #ASPchat dates come closer. Mark your calendar, for this recurring event!!! There are a few other groups looking to raise awareness and facilitate conversation on all things related to the urgent global health threat of antimicrobial resistance. Dr. Brad Langford (@BRxAD) and Dr. Timothy Gauthier (@IDstewardship) are identified as the co-founders of this Twitter chat initiative, which aims to promote appropriate antibiotic use by stimulating conversation about antimicrobial stewardship. The US CDC Get Smart Week (@CDCgov) is acknowledged for inspiring the creation of this Twitter chat, the first of which took place during the 2016 Get Smart Week. Where to send questions or comments? Q1: What is the role of the staff or clinical hospital pharmacist in antimicrobial stewardship? @Julie_Justo: Amazing what they can do if they know the why behind ASP recs. Once we teach the concepts they run with it! Q2: How can community-based pharmacists practice antimicrobial stewardship with limited free time? Q3: What would you identify as the PRIMARY role of an #antimicrobialstewardship pharmacist? @JMIDPharmD: Patient safety. The ultimate balance between risk and benefit. The primary role will depend though on hospital setting. @IDstewardship: #1 for me is leading change to the organizational culture and systems which promotes appropriate and safe antibiotic use. Q4: How should #antimicrobialstewardship pharmacists engage non-pharmacist healthcare professionals to improve practice? @mmPharmD: View each intxn as teachable moment. With each abx approval, give a pearl of info. Bits of info over time = learning. @KisgenUF: Can’t come in with the mindset of antibiotic police. Must be collaborative and help everyone understand “why”. Q5: Are there lines antimicrobial stewardship pharmacists should not cross? @KisgenUF: Quality care must come before cost. If we do the reverse we will end up hurting patients and our credibility. Q6: How will the role of the antimicrobial stewardship pharmacist change in the coming years? @BRxAD: developing partnerships with behavioral scientists/sociologists to help better address antibiotic misuse. Q1. From a philosophical perspective, what should the role of regulatory bodies be as it relates to antimicrobial stewardship? @IDstewardship: Regs should be multi-pronged –> patient safety AND protect antibiotics. Thankfully these things go hand-in-hand. @mmPharmD: How to be effective without overwhelming? How to target all patients without just handing out more papers? Q5. What advice do you have or have you gotten to help address regulatory standards on antimicrobial stewardship? Q6. What resources would you recommend people access as they seek to adhere to antimicrobial stewardship regulatory requirements? Q1. What stewardship interventions are the highest yield in the ED? Q2: What is the biggest barrier for doing antimicrobial stewardship in the ED? Q3: What is the role of ED PHARMACISTS to support stewardship efforts? @NadiaEMPharmD: Promotion through education. 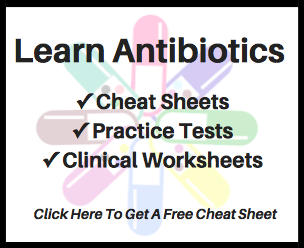 Consider patient risk factors AND suspected bug(s) when selecting antimicrobials. Q4: How can inappropriate antibiotic use in the ED be reduced? @mmPharmD: Adopt rapid diagnostics. Does your have an ED PharmD and RDT? Can I come work for you?? @NadiaEMPharmD: Surveillance of prescribing trends, challenging cases, and rates of antimicrobial resistance can make big wins. Q5: How should patient education in the ED be undertaken? @IDstewardship: Engaging trainees I always see as a win, investing in the future. Important to be a mentor. Q6: What antibiotic education message is MOST important for ED patients? Q1. What is your opinion on rapid diagnostic tests for abx stewardship? @ErinMcCreary: @manfordou takes education & respect for micro lab as well. not just having machine but knowing when techs there to work it! Q2. What metrics should be used to justify #RapidDiagnosticTesting personnel + equipment resource commitments? Q3. What is the best way to approach rapid diagnostics test implementation? Q4. What are institution-specific considerations for rapid diagnostic testing? Q5. With rapid diagnostic tests, where is the most “bang for your buck” delivered? Q6. What unanswered questions do you have at the X-roads of rapid diagnostic testing & antimicrobial stewardship? @mmPharmD: Outcomes data! Please please please publish your experience with RDTs! Q1. What is an example when implementation science & design is relevant to antimicrobial stewardship? Q2. When designing or preparing for implementing a new service/ system, where should we start? Q3. Are there major pitfalls to beware when designing or implementing a new #abxstewardship tool or service? @BWDionne: Make sure stakeholders are aware (and involved) early. Better to have them asking when it’s coming than surprised by it’s release. Q4. What technique is most helpful for identifying the quality of a new tool/service during the implementation phase? @dest112: FaceTime is so critical. Majority ASP recs can be accomplished during walk rounds with ID consult service. @KisgenUF: If it’s a new IT related tool, have end users try it out in “test mode” first to see if it has value and identify barriers. Q5. What design principles can be used to make complicated systems more user friendly? Q6. What resources or examples do you refer to or recommend for designing/implementing changes in healthcare? Q1. How are didactic or experiential curricula in your profession evolving to include #AntimicrobialStewardship concepts + principles? Q2. Which trainee group do you want to engage most for #AntimicrobialStewardship education and why? @DHpharmd: See every trainee as an opportunity to influence a future colleague/clinician. Physician and nurse trainees too! Q3. What activities have you found most effective for helping trainees learn about #AntimicrobialStewardship? @IDstewardship: Pharmacy students & residents often get their minds blown by going to the #microbiology lab …actually seeing MRSA! @XanderBOS: Speaking as a trainee, presenting cases, especially ones where a you’re recommending a different tx than current staff plan! Q4. Are there areas of low-hanging fruit for interdisciplinary #AntimicrobialStewardship education? Q5. How can we inspire the future generation to take interest in learning about #AntimicrobialStewardship? @Dest12: Patient cases of untoward outcomes due to resistance/overuse of antimicrobials. Ask “what would you do if this was your family”? Q6. How big of an issue is the mismatch btwn the current supply & likely future demand of ID/stewardship MDs & PharmDs? Poll response: 41 votes; 5% not really a problem; 15% kind of an issue; 54% a substantial issue; 26% red alert!